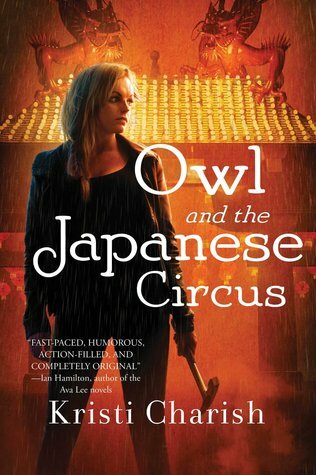 Without doubt Kristi Charish’s third instalment of the Adventures of Owl definitely took this series to the next level for me and was my favourite so far. If you haven’t read the previous novels then be aware that spoilers may be lurking below. In the latest instalment Alix Hiboux, or Owl as she is better known, really finds herself between a rock and a hard place with conflicting priorities and demands. If you haven’t read the series, Alix, with a promising career in archeology to look forward to, was used as a scapegoat by the IAA (The International Archaeology Association who regulate and keep under wraps anything and everything related to the supernatural). Finding herself with zero job opportunities to look forward to Alix resorted to the one thing where she could put her skills to use – acquiring, or stealing if you want to put it another way, antiquities. As the Electric Samurai begins Alix is given an assignment by her boss Mr Kurosawa, who happens to be a dragon with something of a volatile temper. His assistant, Lady Situ is a Naga who can and will hold a grudge and currently seems to hold one against Alix. Basically, there’s no way that she can refuse this job even though it’s far from ideal and involves finding a magical suit of armour that transforms to fit into the period in which it’s used. It seems the suit gives the wearer great powers, although it does require a high price in return. The elves are keen to get their hands on the suit and in order to prevent war in the supernatural world the Dragon has agreed to their request. It’s not going to be easy to find the Electric Samurai. It’s last location is unrecorded and nobody has a clue what it looks like. And, to make matters worse Rynn is very unhappy with the involvement of the elves as through past experience he has learnt that they are sometimes economical with the truth. At the same time, the IAA are pushing Alix to find the location of the World Quest designers. They’re keen to question them about human magic and think Alix stands the best chance of finding them. Alix is keen to find them, not least to give them a warning. World Quest has become an invaluable tool for her in mapping out antiquities around the world. Again, the two are not going to be easy to find. They seem to have disappeared into thin air and rumour has it that they’ve found the legendary city of Shangri-La. What a temptation for Alix – to go after the lost city. Unfortunately, time is short and the IAA, not content with coercing her have seen fit to hire mercenaries by way of additional encouragement. There is plenty going on in this book. There’s a lot of supernatural politics that left me not really knowing who to trust or if I should trust anybody at all. There are plenty of exotic locations. There is a deal of cat and mouse type activity and nothing is as it first seems. So, why is this book my favourite so far? Well, I felt it had more depth than the previous instalments – which isn’t a criticism of the previous two at all, just that this one has a different tone somehow. It could be related to the fact that Alix seems to be becoming more notorious and in doing so seems to be really entrenching herself amongst the supernaturals, it could be to do with the fact that Rynn and Alix seem to have reached a different stage in their relationship where things didn’t always seem to be going so well, or it could simply be that the stakes were so much higher. But, this definitely had a different pace and feel. The usual characters are not all as evident. Nadya is off dealing with issues at her bar and Captain starts the story in the custody of the Naga although his release is eventually negotiated. This time around the story focuses much more on Alix and Rynn. There is a very good reason for this which I won’t go into here but this new focus helps to shine a light on some of the cracks that are starting to show in the relationship. We certainly learn a little more about Rynn which I thought was really interesting. I’m not going to say that it answers everything but it certainly makes a good start. In terms of Alix. She’s still as reckless and impulsive as ever but again there was something different in her character. I can’t quite put my finger on it but it felt like the relationship is becoming more serious somehow, it’s passed the giddy infatuation stage and is at the point where they’re both starting to really question each other. In terms of criticisms. I don’t really have any to be honest. I think the only thing that occasionally popped into my mind is a random feeling of surprise that the majority of Alix’s archaeological work seems to require more research on a computer than actual field work. That being said she does then jet off to Nepal, China and Tokyo! I won’t say too much more. I just really enjoyed this one, it felt less fun maybe than the previous two books in that the stakes are higher and Alix and Rynn felt more vulnerable somehow, almost desperate, the settings were great to read about and the author throws in a few unexpected surprises in relation to both of the quests. Finally, I have to mention the ending. The earlier parts of the story may have enjoyed a gentler build than previous books but the ending certainly comes out all guns blazing. I just loved the route that Charish took, not least because I really hadn’t seen it coming and it was such a shock! Literally, I had to stop reading and have a little reread and I don’t mind saying that inside my head I was saying ‘nooooooo’ – and that was right when the book ended. Yes, it ends on a cliffhanger, I can admit I’m not a lover of cliffhangers but I think I was still so surprised by everything that I had barely a chance to register anything beyond the sound of my mouth flopping open. This wait is going to be so hard – no pressure Ms Charish but when is the next book due?? Enquiring minds need to know.